Peanut butter and banana: not just for delicious sandwiches any more! So I have nothing really that healthy left in the house besides some cheese and crackers, but I refuse to do groceries because if I starve, then I will have more money to… hoard. I think I may have a Smaug-shaped problem. HOWEVER pb+b is like my favourite combo in existence ever, so while I really didn’t want to be all unhealthy and have pancakes for dinner (a habit of mine in Japan), I also kind of wanted to try this to see if it would work. Yes I am having pancakes for dinner, and no you are not allowed to judge me, because at some point in your life, YOU HAVE TOO. Also, credit where credit is due: I smooshed together two recipes from this post on FitBlogger and this one over at Easy Natural Food. Thanks, peeps! You have made my dinner much more awesome! Mash ye banana with ye fork. Add ye peanut buttre – if you refrigerate said buttre, microwave iytte! Adde ye egg and mykks. Heat up a medium-sized skillet to medium, and add some veggie oil. In a separate bowl, mix the dry ingredients together, then add them to the wet and mix ’em all up. After that, use the age-old tradition of scooping the mix into the heated pan (I used two spoonfuls), then flipping when the bottom is cooked. 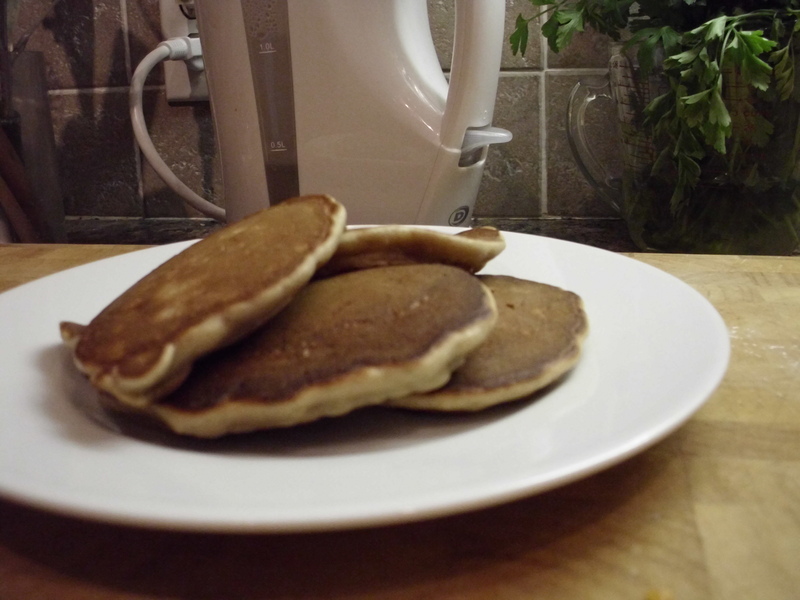 As far as gluten-free pancakes go, these are by far some of the most flippable, plus they’re spongy and super-soft. 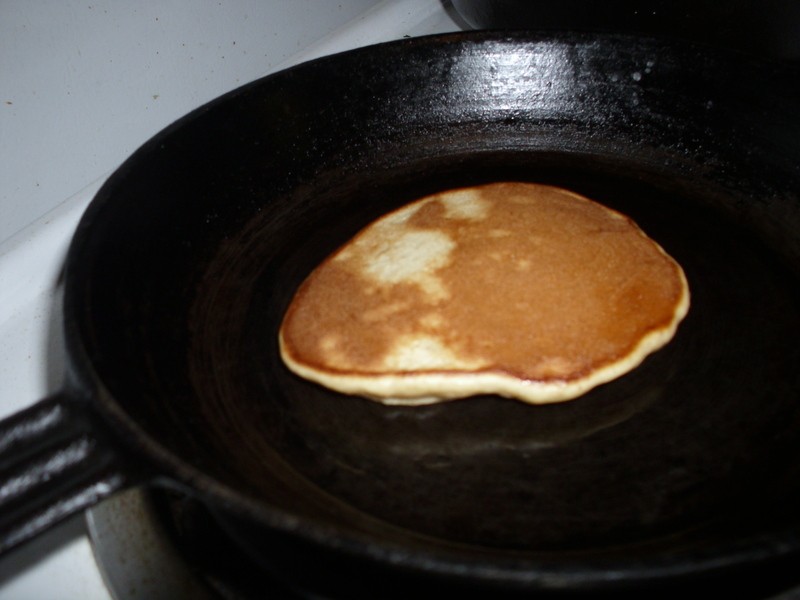 I don’t think you understand how much I appreciate that; GF pancakes, in my experience, tend to turn out crispy or rubbery about eight times out of ten. The best part about this whole thing is that the banana is so naturally sweet that you don’t need to add sugar to the batter, and the pancake still comes out super-sweet, with the nuttiness (and a bit of the stickiness) of the peanut butter. I didn’t even put anything on them, just ate them straight off of the plate while they were still steaming. Yay! Looks tasty! I don’t my recipes being “smooshed” around a little if the result comes out to your liking 🙂 Those sure are some good looking pancakes! Thanks! I draw my inspiration from all the lovely people posting gf recipes on the interwebs, and I admit that I would be lost without them, so thank you!